The unstoppable Jonathan Rea (Kawasaki) took another two wins at Magny-Cours this weekend and secured his fourth WSB championship in a row! In Race 1, Rea’s Kawasaki teammate Tom Sykes followed him home in second place, with Xavi Forés (Ducati) third. Race 2 saw Chaz Davies (Ducati) gain his first podium since returning from injury by finishing ahead of third place Michael van der Mark (Yamaha). You will find full results for Race 1 here and Race 2 here. For additional details and points, visit the official WSB site. WSBK with Jonathan Rea ….. Yawn … At least it’s making Moto America look more interesting. He is the reason I don’t watch superbikes anymore. It is boring!!!!!! Just rea and kawa the whole time. I would love to see him AND Kawasaki in MotoGP. Has anyone been following 300SSP? Congrats to Ana Carrasco! amazing! Now I’d like to see him in MotoGP. Yes, it is time for the guy to get a call. He shouldn’t be playing in the minor leagues anymore. He would get a satellite ride in MotoGP and be a bit player in the big show. Better to be a Kawasaki Hero in WSBK and retire a legend. You assume he would get a satellite bike, but that isn’t necessarily the case. Even if a satellite bike were the only option, landing on an LCR Honda or Pramac Ducati wouldn’t be such a bad deal. 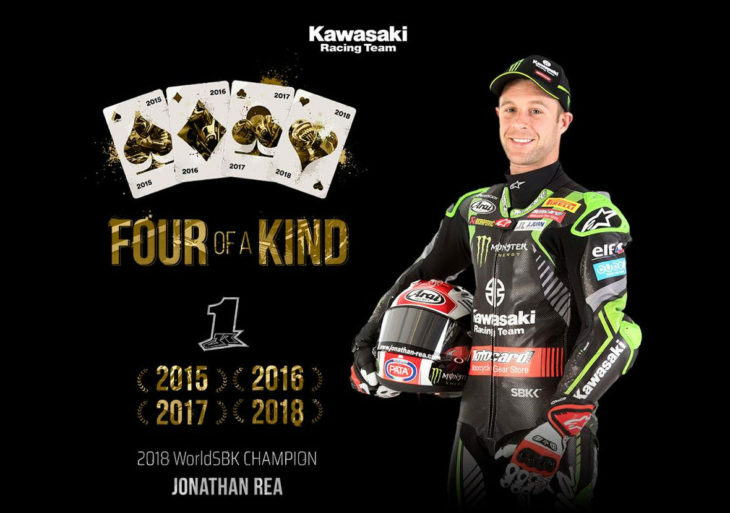 While it wouldn’t make any sense for him to move to MotoGP without a good bike to land on, no true champion would want to end his career in WSBK, even one as glorious as Rea’s. A green day for Kawi.